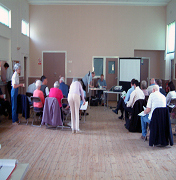 Facilities: St Cuthbert’s has a church hall and a meeting room. The church space can also be used for community events. Weddings and queries relating to Hall hire. The meeting room holds 40.